What’s both relaxing for you and encouraging to others? Spending a few minutes coloring a note card and then sending it to a friend! Here’s a free “thank you” card download to help you get started! There are more articles on the internet than I can possibly read about the advantages of coloring for children and adults. The benefits of this artful activity include improving fine motor skills (which improves handwriting among other things), stimulating creativity, increasing color awareness, growing patience, recognizing patterns, and reducing stress and anxiety. Coloring is also a great way to experiment with a new media and, of course, it’s great quality time with your children. Coloring is more than cheap therapy, it’s a valuable life habit. How Does This Bring Them Joy? Once you or your child has finished their beautiful art, what do you do with it? If it’s already in a note card form, you can easily send it to a friend with a short handwritten note. 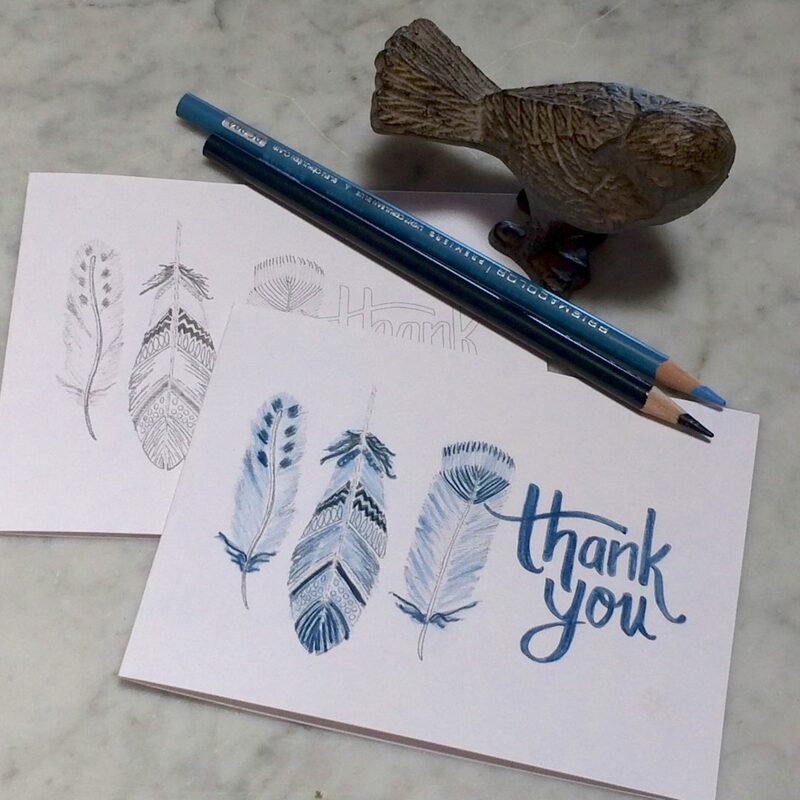 Sending a handwritten note is such a great practice for some many reasons. First, we all love to receive cards and notes. Anymore, looking through the mail is usually a exercise in separating the bills from the trash. However, when I see a small note card from a friend in the middle of the mess, it brings a huge smile to my face. It’s one of life’s simple joys for sure! Second, whether it’s a “thank you” note, a holiday card, or a birthday celebration, writing down a message to a friend is a great way to connect at a deeper level. It gives you the opportunity to say the things that you may have forgotten to say and to encourage someone in a unique way. “Words of Affirmation” is one of Gary Chapman’s Five Love Languages and I believe written words function differently than spoken words in how they encourage and affirm others. Many people save the hand written notes they receive and reread them year after year. Handwritten words are gifts that give for years to come. Struggling to Figure Out What to Write? It REALLY is the thought that counts here- however, sending a blank card might be pushing this idea too far. So what do you say? What has this person done to show they care about you? What character trait of this person do you most enjoy? What would encourage this person? 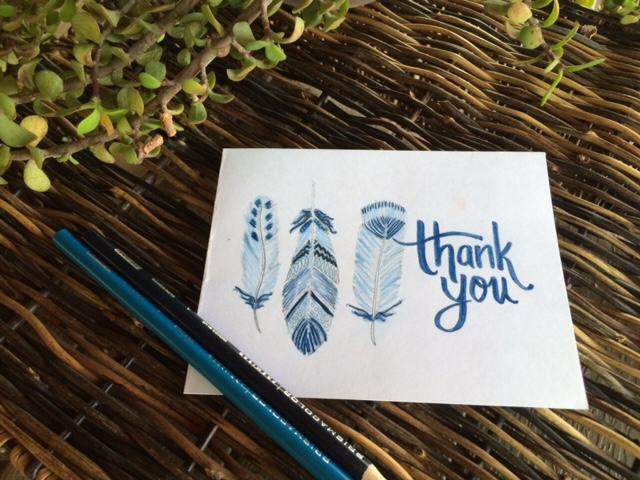 The artful practice of sending a hand-colored, handwritten note is easy and so beneficial! 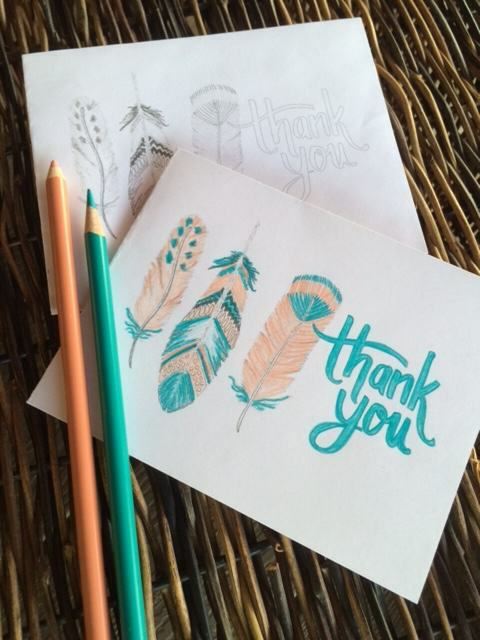 It combine two of my favorite things: Coloring and Handwritten notes! I hope you’ll try it with your children today. I have a selection of printable cards available for purchase, but here’s a free “thank you” card download to help you get started!